Once again I have to graciously thank Manoah for the prestigious opportunity of getting to be one of Samsung's brand Evangelist. Never in my life I've ever thought that i would go this far in the blogging industry especially since i started of being a "syok sendiri" blog lol. Being able to get together with Samsung is indeed an opportunity of a lifetime and I owe that to a respected man and a friend that has always supported me, Donovan. And ironically after missing KLFW on wednesday because i forgot my wallet, guessed what happened again at this event (it was on a Thursday btw)? Couldn't believe all of us fell for it lol! Linora introducing our awesome supportive clients from Samsung, that night was a night we get to know each other better. To build a stronger relationship bond between us bloggers and Samsung :-) It's indeed a rare opportunity for us so I'm grateful for this private get together session with them. 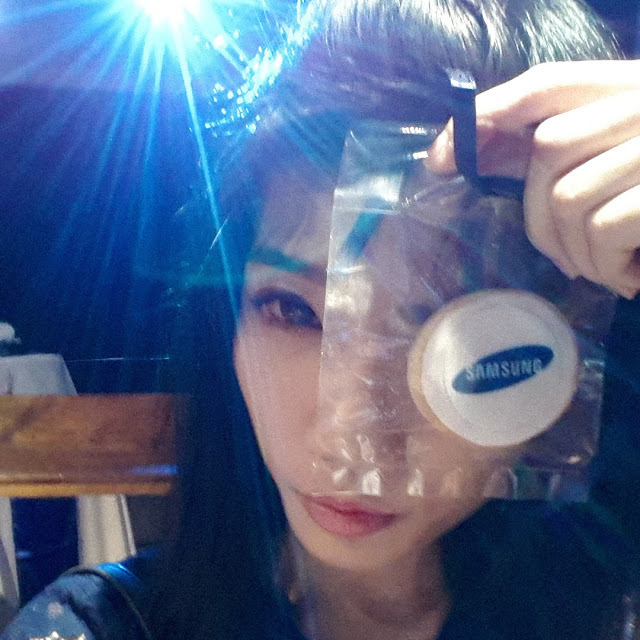 Look at my cookie, customized Samsung Cookie lol i was photobombed by the blue light while selca-ing XD Thank you Samsung and Manoah for the wonderful night!